Make sure your chicken is clean as you add it to a medium sauce pan along with the cups of water, add the bay leaves, 1/2 teaspoon of salt and black pepper. You can add the whole onion just to help the scent of the chicken as it cooks. Leave the chicken to boil, and start peeling of the skin from your red onions and cut them into small squares. Add the chopped onion into a separate small sauce pan along with the olive oil, 1 teaspoon of salt and 1/4 teaspoon of cumin. Leave to boil and before the onions are well cooked add the sumac and mix very well. Once the chicken is completely cooked, turn off the heat and remove from the pan to leave aside until it cools. Start shredding the chicken over the onion as it is being cooked, and mix very well. Leave them to boil for another 10 to 15 minutes. Then turn off the heat and leave them to cool. Start cutting your shrak bread into big triangles, almost covering both your palms. 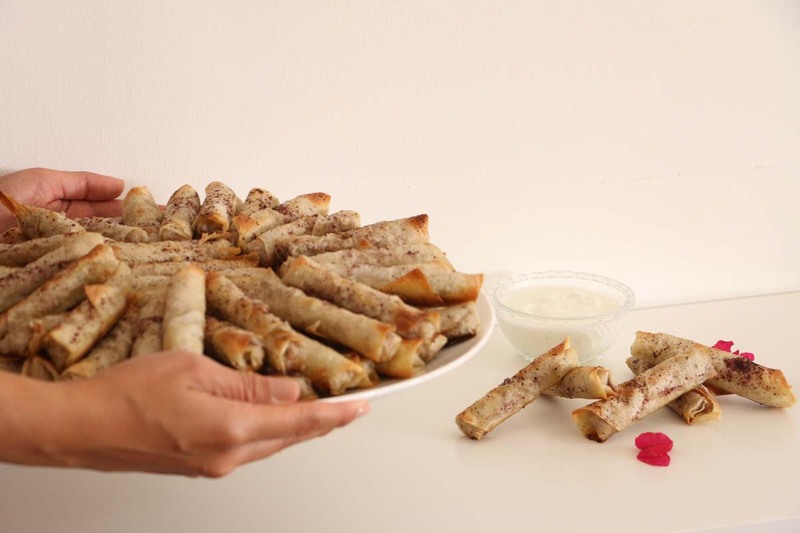 Mix the pine-nuts along with the chicken and onion and using a tablespoon, fill each shrak triangle with a spoon and a 1/2 and close it from both angles of the triangle and roll it to form your Msakhan Roll. 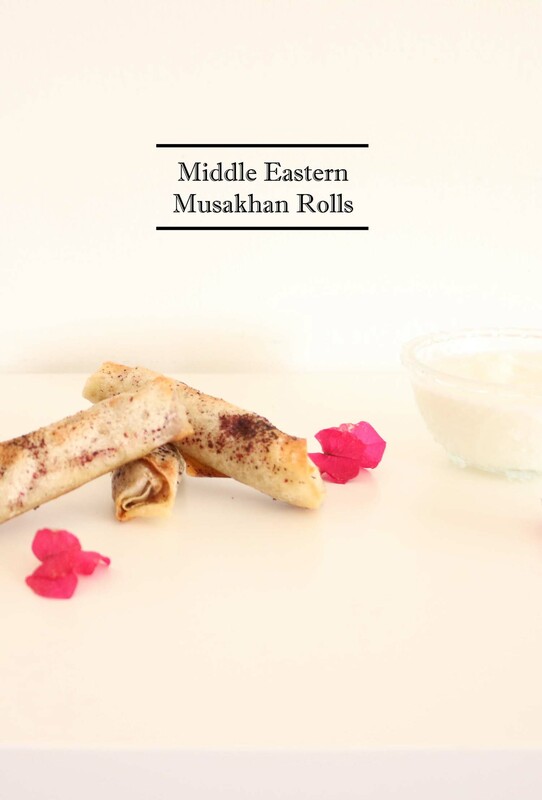 In a big cooking tray, spread some olive oil on the tray as you line the Msakhan rolls one after the other. Once complete, sprinkle the rolls with some more olive oil and sumac. Place the tray in the oven for about 20 minutes, until your rolls are a little bit crunchy and golden. 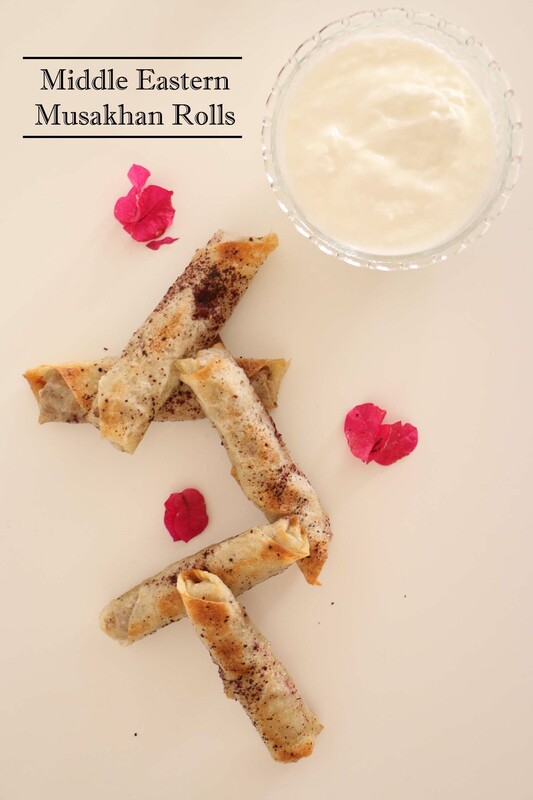 And Voila, enjoy your Musakhan Rolls, some people enjoy it with yogurt on the side. 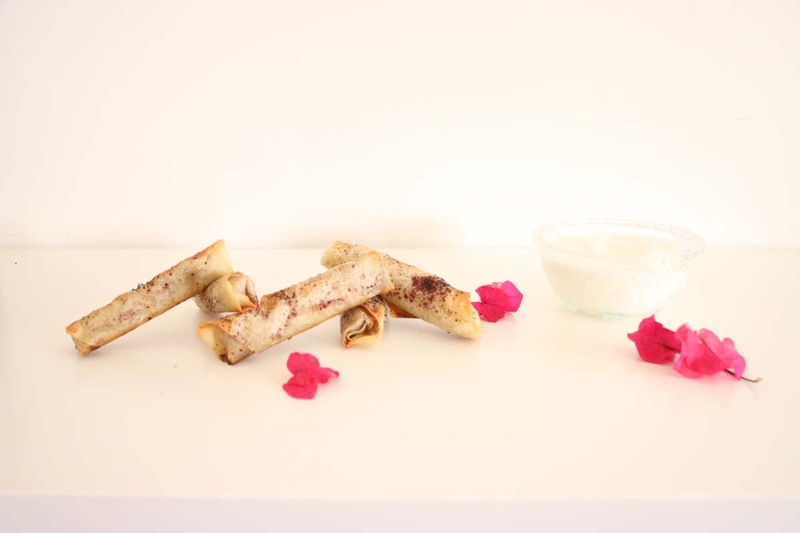 Some make it as an appetizer dish, and some as finger food along with other dishes. ١- نضع الدجاج، الماء، الملح، فلفل اسمر و ورق الغار في قدر و نتركه على النار. نضف البصل لازالة الراءحا. ٢- تقطيع البصل الاحمر الى مربعات صغيرة. ٣- وضع البصل في قدر مع زيت الزيتون، ملح و كمون. ٤- تحريك طبق البصل، و اضافة السماق قبل ان يستوي البصل. ٥- ارفغي الدجاج من القدر و ضعي ليبرد. ٦- بيديكي، قطعي الدجاج فوق قدر البصل و الخليط لمدة ١٠ دقاءق غلي. ٨- قطعي خبز الشراك الى مثلاثات كبيرة الحجم. ٩- اخلطي الصنوبر مع خلطت البصل، و بستعمال المعلقة الكبيرة، ضعي معلقة و نصف من خلطط البصل و الدجاج فوق خبز الشراك المثلث، و لفي الخبز على شكل الرول. ١٠- في صنية كبيرة للفرن، ضعي قليل من الزيت الزيتون ثم ضعي المسخن رول الجاهز. ١١- ضيفي رشت زيت زيتون فوق المسخن رولات و رشة سماق. ١٢- ضعي الصنية في الفرن لمدة ٢٠ دقيقة حتى الاحمرار.